On Wednesday 3rd June we marked the 25th anniversary of the opening of our Froud Community Centre. We celebrated the centre, which opened on 22nd June 1990, with a packed day of activities. Proceedings kicked off with a celebratory lunch for a number of people who have had a long-standing connection to the Froud Centre including Mary Froud, wife of original warden Jimmy Froud, after whom the centre is named. There was plenty of opportunity for reminiscing, reconnecting, eating cake and taking part in a quiz! After school, our open community afternoon showcased activities such as ‘Guess the Vegetable’, ‘Splat the Rat’, paint rockets, and a bouncy castle. We organised a balloon race for local families to come and take part: and look forward to seeing who wins the prize for the balloon which has travelled farthest! Various groups who currently use the Froud Centre hosted stalls displaying their work and we were entertained by performances from the Over 60s Keep Fit group and Manor Park School of Dance. Finally, the evening part of our day of celebrations saw a special discussion about the value of shared community spaces, with our guest speaker, Tony Armstrong from Locality. This gave us the opportunity to talk about our future plans for the Froud Centre. We received a number of lovely comments from those who attended telling us of their experiences of the centre and what it’s meant to them. 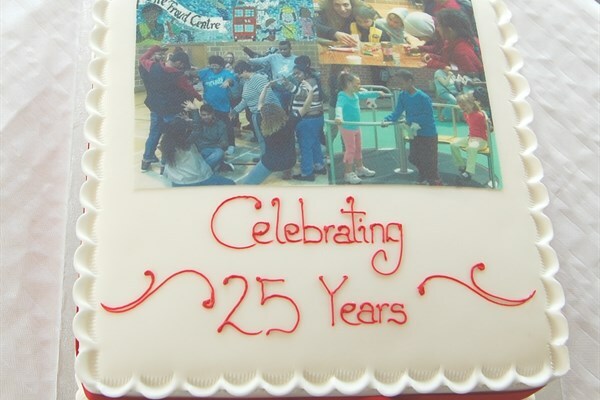 We are very proud that the centre has been such a community hub for the past 25 years, and look forward to what will be in store for the next 25!